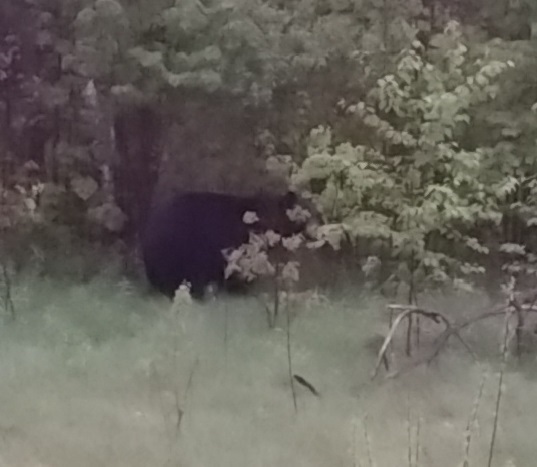 It’s blurry but that’s a big old black bear a few miles from my house. I’m a tad behind in my word count updates. Got distracted by a few things including a call for scripts for my old film producer (she’s quite young actually). An idea sparked and I wrote 62 pages of a feature last week. For the first time ever, I didn’t use an outline. I just had a basic idea. Got well into the third act (there was some skipping around) and realized I didn’t like one of the main characters. I scrapped about 40 pages and took the story in a new direction turning a one scene character into the other lead. (And that’s why I always use an outline) The story is now blazing ahead and my old (yet quite young) producer is quite happy. As usual, I don’t expect anything to come of it. Having two scripts dropped by production companies two days apart is what got me into the idea of books instead of scripts. Seemed a better option for me. unfortunately, I’d forgotten how much fun scripts are to write so I have a sad feeling that there will be more. Maybe I will be able to turn those into books. I also got to day dreaming while sitting on the 6th hole manning the beer cart and wrote 1800 words for a new series involving genetically altered humans. Not something I expected to ever do. I’m thinking 4 novellas, with each told from a different characters perspective, with each being around 17k words. Probably aimed at the YA audience. So far the characters are drifting that way. We’ll see what happens. For now, here’s the word count. Okay, this looks bad. I admit it. BUT…I finished chapter 10 and chapter 11(1,635 words in 11 and about 600 new words for ch 10 just today) and sent both to my editor. I realized I had a folder of notes in with my word count chapters so that explains how I wrote over 2000 new words but lost 70. I’ve made sure that none of my remaining notes are included in the word count, so the tally will go up from here. My goal for this week: chapts 12 and 13 done and to my editor. I feel like I’m on a roll so I’m going stay at the computer as much as I can. I’ll also be working on my altered human series. That one I’m writing on my cell phone while I man the beer cart on Wednesdays and sunny Saturdays. I hope to have a rough draft of the whole book in about three weeks but we’ll see. I also want to finish that script for my old (but seriously young) producer ASAP. It looks like it will be a busy week, so I’m back to it. This entry was posted in Sunday Word Count. Bookmark the permalink.